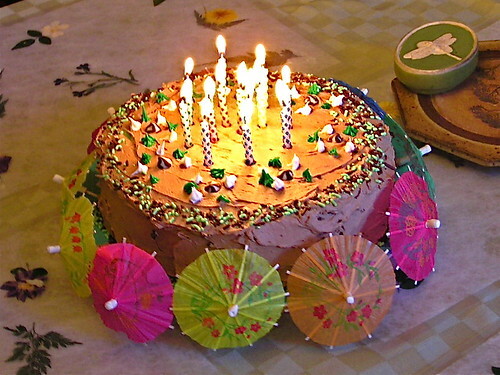 birthday cake '08, a photo by normanack on Flickr. Okay, so we've all presumably had a birthday, and the best part of that is cake right? Well, I came home from school one day and there was only a tiny piece of my cake left (it was my birthday), I was totally convinced that my mom purposely took a larger piece. I basically got so mad that I wanted to hit and break things, which isn't good. The emotion of anger is okay, but when it is over a piece of cake...maybe something is off. But then again my family is known for being very emotional, like I cry when watching "Ellen" sometimes. But on the other hand, I'd rather be too emotional than have a stone heart and let nothing effect me. But back to the story, I asked her about the cake without really telling her I was angry, and turns out her piece was small as well and she didn't purposely take a big piece. I calmed down pretty quickly after that. I think I should have just asked her outright though, than I probably wouldn't have gotten so angry. So, the moral of the story is don't take another person's cake. Or I guess you could see something about not overeating and talking about your anger instead of keeping it bottled up, but it's whatever you take from it. What is stupidest thing you have ever gotten angry over?